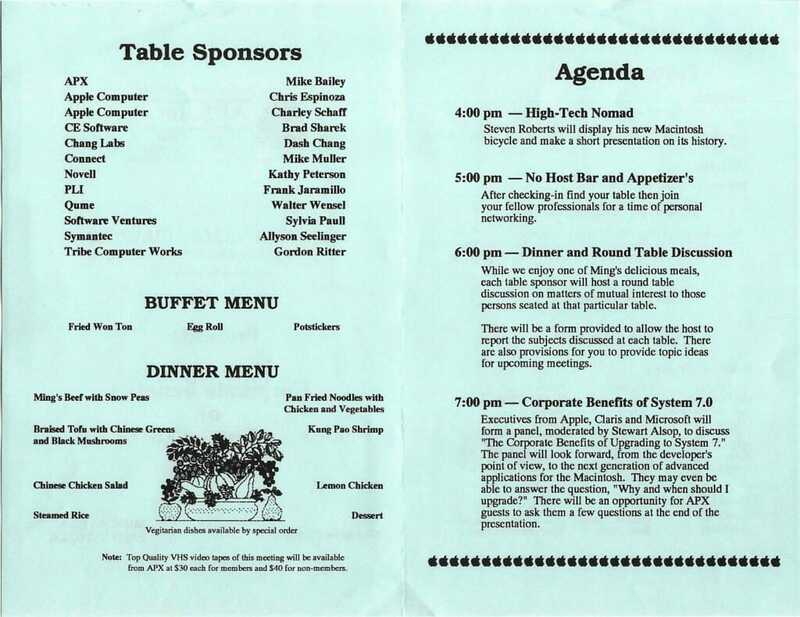 This was a local event for me during the Bikelab era – I rode the bike over to Ming’s Villa restaurant in Palo Alto and gave a talk for a group of Macintosh-literate business folk. Notables of the evening included Stewart Alsop (discussing the upgrade to System 7.0) and Chris Espinoza of Apple. 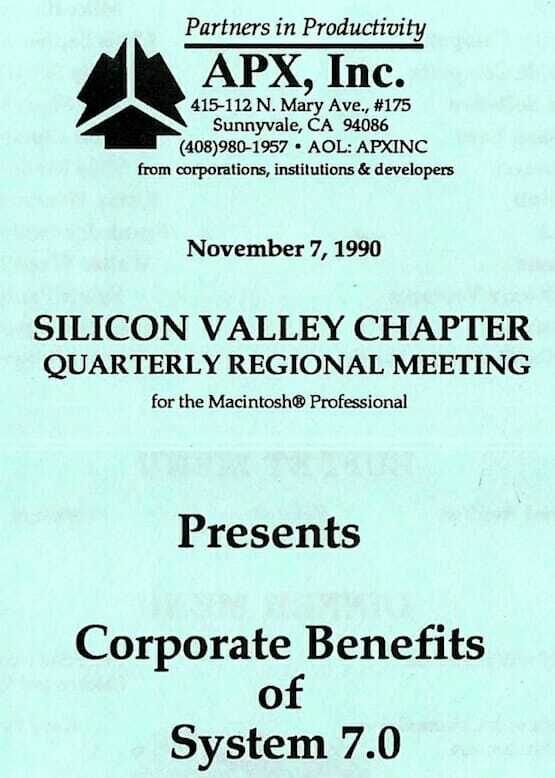 This took place while BEHEMOTH was under development in the sponsored space at Sun Microsystems, and the presentation covered work-in-progress including the integration of a repackaged Macintosh Portable into the bike’s console… with handlebar keyboard and ultrasonic head mouse. Steven Roberts will display his new Macintosh bicycle and make a short presentation on its history. Executives from Apple, Claris and Microsoft will form a panel, moderated by Stewart Alsop, to discuss “The Corporate Benefits of Upgrading to System 7.” The panel will look forward, from the developer’s point of view, to the next generation of advanced applications for the Macintosh. 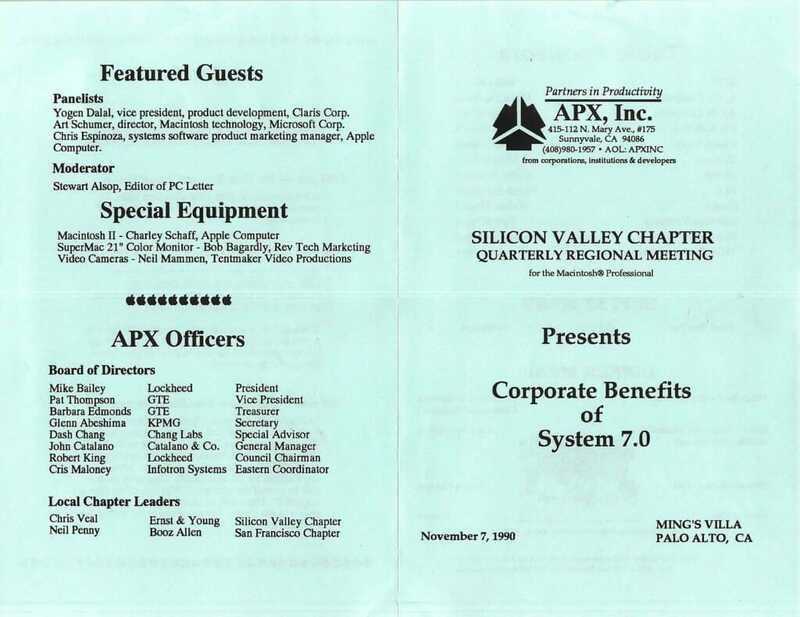 They may even be able to answer the question, “Why and when should I upgrade?” There will be an opportunity for APX guests to ask them a few questions at the end of the presentation.